Bankerosion on the Hillsboro Canal contributes to the buildup of sediment around coastal structures such as the G-56 located on the eastern end of the canal just west of Military Trail The South Florida Water Management District (SFWMD) conducts regular inspections of the regional water management system — which includes more than 1,600 miles of canals — to prioritize projects necessary for the system’s continued operation. 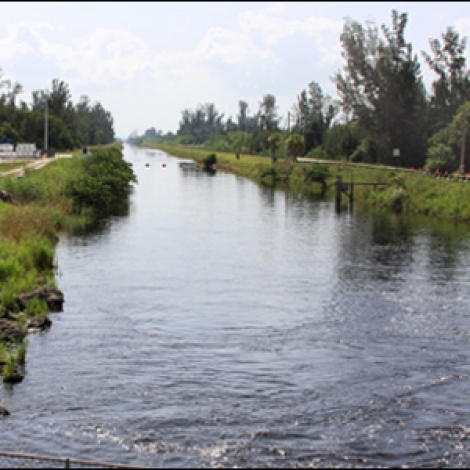 Through the inspection program, the District identified the need to repair and protect the banks of the Hillsboro Canal. Over decades of service, extended sections of the canal banks have eroded or detached from the bank slope and fallen into the canal. These bank failures limit the flow of water in the canal, creating the potential for flooding impacts in Palm Beach and Broward counties during a major storm or hurricane. Accumulated sediment will removed to ensure that these structures can provide adequate flood control protection. The Hillsboro Canal Bank Stabilization Project will improve the stability of the canal banks and restore the canal to its intended capacity. The District is designing a cost-effective solution to also maximize flood protection for surrounding areas. The Hillsboro Canal’s rightof-way extends several feet landward from the top of the canal bank. The placement of encroachments such as trees, docks and fences within the District right-of-way requires a Right-of-Way Occupancy Permit, which is a revocable license (Chapter 40E-6, Florida Administrative Code). Some residents who live along the Hillsboro Canal have planted vegetation or added structures such as boat docks within the District’s right-of-way along the canal. To guarantee the integrity of the Hillsboro Canal Bank Stabilization Project, the District will need to remove some of these encroachments. Residents may be able to replace some of the structures following completion of the canal bank stabilization project, provided the structures meet the regulatory and project operation/ maintenance requirements.Many — but not all — of the structures that could be removed have been permitted by the District. These permits protect the District’s ability to effectively and safely use canal and levee rightsof-way in the regional system while providing for compatible public and private uses. • Design: January 2012 through March 2013. • Construction: June 2013 through March 2015 . This project will definitely have a positive affect on flood protection but may have some consequences in compliance to the residents of waterfront property owners both in Broward and Palm Beach County. As a new resident to the “Cloisters” I have raised some of my concerns and questions as to how it will effect my property along with many of my neighbors and will continue to provide updates on this project. My thanks to Gabe Margasak Media Relations Representative and Laura Cory, Representative from Out Reach and Pam Mac’Kie Inter Governmental Specialist for the South Florida Water Management District for providing me information on this project.